This is a unique 9mm self defense round from Fiocchi. 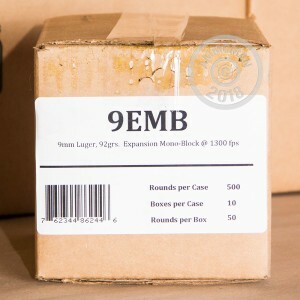 The innovative Expansion Mono Block (EMB) ammo utilizes a solid copper projectile to prevent jacket/core separation. Fiocchi's EMB rounds feature a light, 92 grain, bullet that fires at 1300 feet per second and are designed for expansion on penetration. 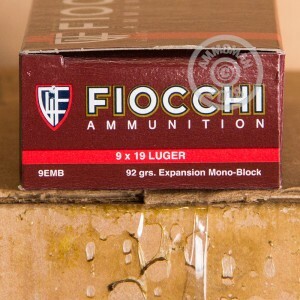 Fiocchi has been producing ammunition since 1876 and is still family-owned. 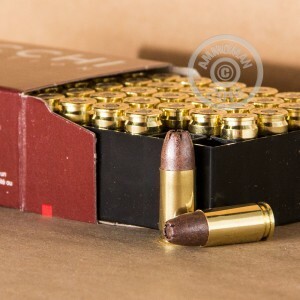 Pick up a case of these rounds to get free shipping from AmmoMan on your order over $99!